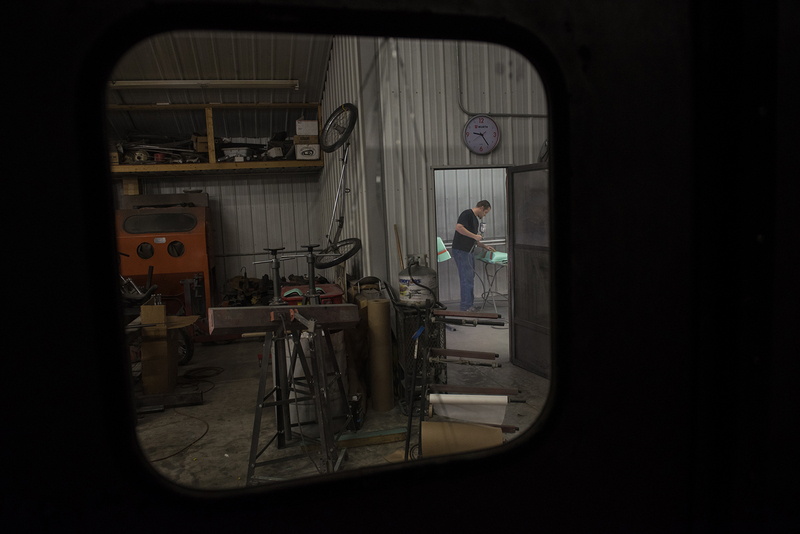 Brad Starks is surrounded by his work in his hot rod shop where he is the only employee. 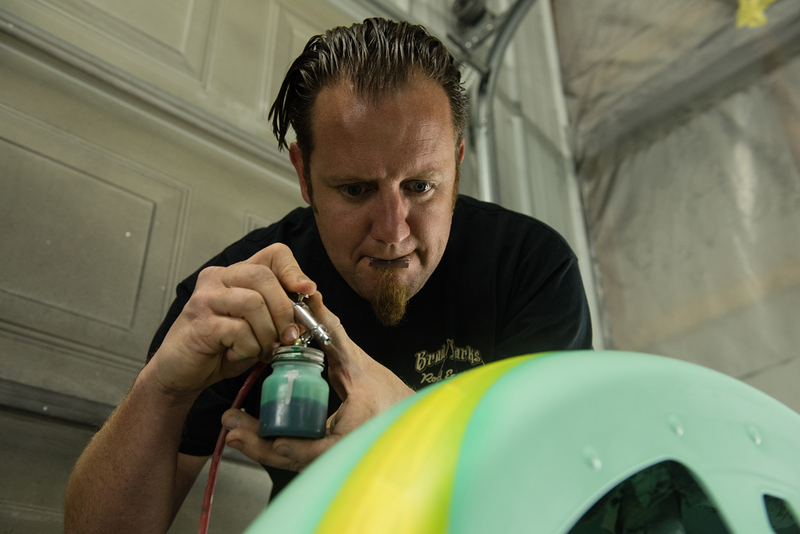 His ideal work is custom builds on vintage cars. In 2009, he worked on a 1950 Ford Tin Woody that earned him national acclaim, including Custom Rod of the Year. Brad Starks will not leave Paducah. His business would thrive in a larger place, but there are people here who need him. Besides, he’s not a city person, anyway. He’s a car guy – hot rods. It’s a hobby he shares with his dad, who is a big reason that Brad stays in his hometown. His hobby turned into a profession and his profession into prestige. 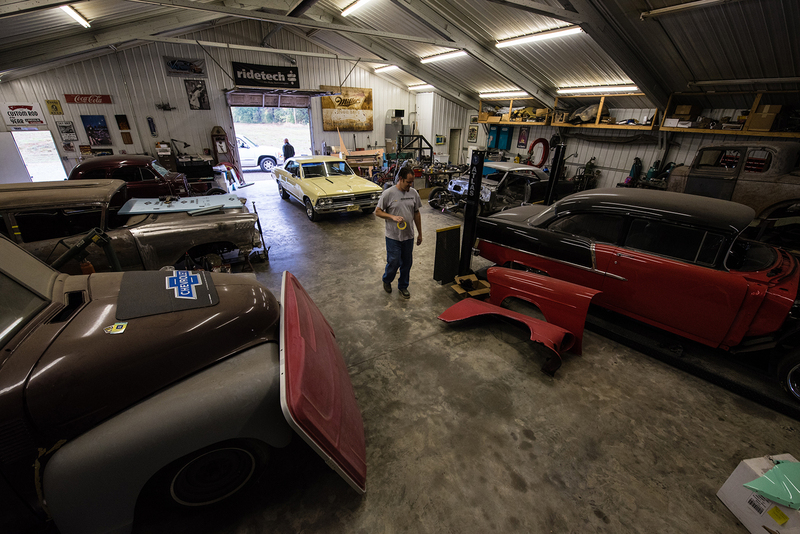 Brad Starks Rod & Custom shop has won national awards – two trophy cases full, though he’s never counted exactly how many. His crowning achievement came in 2009 when he was awarded Custom Rod of the Year for a 1950 Ford Tin Woody he restored and customized, landing him television interviews and appearances on TV car shows. That success translated into steady work, but growth and access to more creative work would require leaving Paducah, which isn’t an option. “With my daughter, who just turned 13, and my dad still here, I cannot leave. I don’t want to leave. No matter how far the passion would go somewhere else, I’m not leaving them,” Brad says. He lives with his girlfriend, Kim Baker, and her two children in their home on the same piece of land as Kim’s parents. Kim and Brad take her kids to their grandparents’ house for dinner at least twice a week. Nearly all of Kim’s family and all of Brad’s family live within five miles of the couple. But his family keeps him rooted here. Brad, who gave up office jobs years ago to pursue his passion and open a custom shop, adds pinstripes to a section of a Harley Davidson motorcycle. 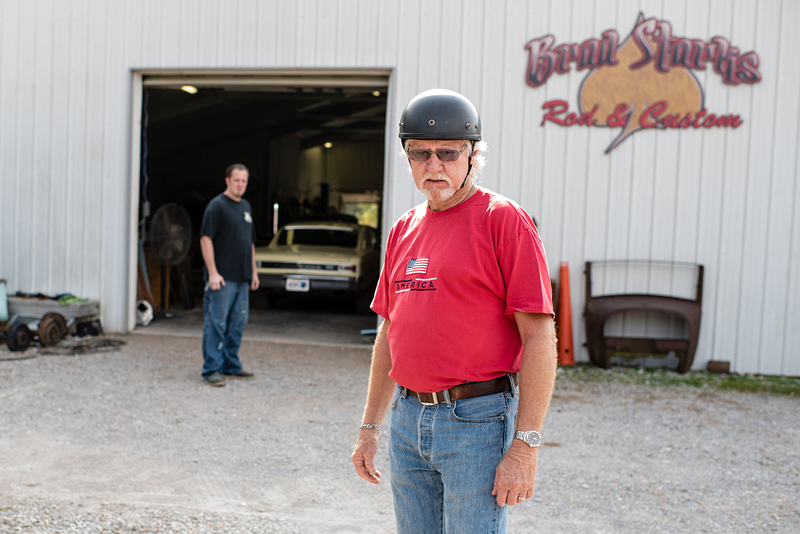 Kerry Starks helped his son Brad open his shop seven years ago and would like to see him be more successful, even if that means moving from Paducah where both were born and raised. “I don’t want him to stay because of me,” Kerry says. While Brad struggles to drum up business locally, he is known on the national scene for restoring old cars. Brad knows that if his shop were in a more populated area, like Nashville, he’d have no problem growing his business, but he says he cannot leave Paducah because his father and daughter live here. Brad and his daughter, Jada, enjoy their weekly dinner together at Fazoli’s. 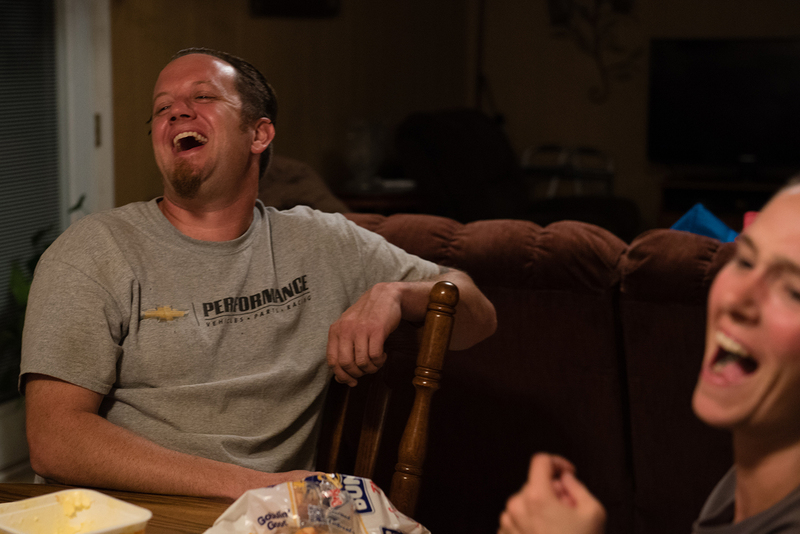 Brad continues to live in the town he grew up in so he can be close to his father and to his daughter, who lives with her mother. Brad (second from right) eats dinner with girlfriend Kim Baker’s family. The couple eats dinner at Kim’s father’s house every Friday night. Brad, Kim and her two children live in an home on the same piece of land as Kim’s parents. Brad spends much of his time with family. He and Kim eat dinner with her family at least twice a week. “Success and all that, it’s just not worth growing up without the family,” Brad says. 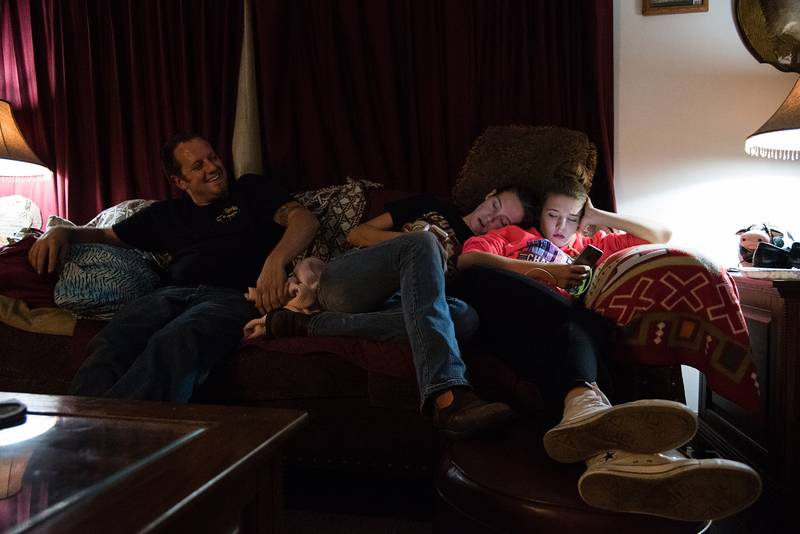 Brad, Kim and her daughter Alyssa Baker relax after dinner with Kim’s family. Kim straddles Brad’s lap while the couple waits for dinner to finish cooking at Kim’s father’s house, where they eat dinner every Friday night. Brad and Kim relax by watching videos on Brad’s cell phone.